At 1 Source Roofing we only use the best products on the market and we provide all of our customers with a solid warranty that covers workmanship for up to 10 years and up to $1,000 coverage for interior damages. We have combined 20 years of roofing and construction experience and are dedicated to putting our customers first. Here are the top 15 reasons that 1 Source Roofing is the right choice for your roofing and construction projects. Only quality products and materials are used on every project. We are professional, affordable, and honest. Always provide prompt answers to questions and estimates. No need to hire multiple contractors, let 1 Source handle your entire project. 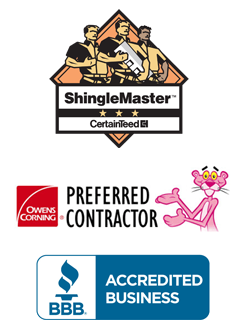 1 Source Roofing is located in Madison, AL and have combined 20 years of roofing and construction experience and we are a member in good standing with the Better Business Bureau. We pride ourselves with having a professional and courteous staff, from our roofers and construction experts to our office personnel. if at any time you have any questions at all, please feel free to contact us through the contact form or call 256-774-8299 to speak with one of our roofing and construction experts. We know that having any work done on your home is one of the biggest decisions that you will have to make and we are here to help you accomplish all of your home improvement and renovation projects from start to finish. We can work with your insurance company and handle 100% of the insurance claim process for your roofing or construction project. We offer roofing and roof replacement, exterior painting, siding, window replacement and gutters with or without leaf guards as well as any kind of home improvement and home renovation work. We can save you the extra hassle of trying to schedule all of this work by yourself. We have people on staff with years of experience in each of these areas who are ready to help you. Let us simplify your home improvement, contact 1 Source Roofing today. 1 Source Roofing is a trusted provider of residential and commercial exterior and interior contracting services. We are licensed, bonded and insured for all work we provide. We are also a member in good standing with the Better Business Bureau.